344'10" by 28'2" by 15'9"
The Rivers were built in 1931-1935. 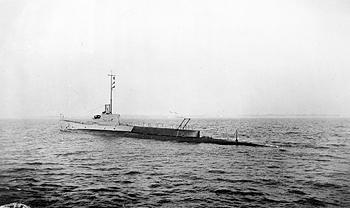 They were the closest thing to a successful fleet submarine design produced by the British Navy, and had excellent surface speed and a less miserable range than most British submarines. Two units were transferred to the Far East. Because their design sacrificed so much for speed, they were relatively unmaneuverable and tended to leak diesel fuel from the tanks located between their pressure and outer hulls. However, they had a relatively large cargo capacity, which allowed them to be used as supply submarines in the Mediterranean. They were probably the most successful prewar British design.